“Your course was very informative. I had success with the method of automatic writing that you taught. 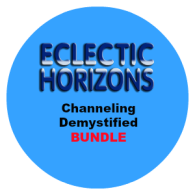 The Channeling Demystified Video is a 22:25 minute video that is a condensed version of our 4-hour instructor-led class. In this video, Cindy will provide an overview and go on to describe three types of channeling. This condensed version does not include student interaction or the trance channeling demonstration that students experience in the live class setting. The Channeling Demystified Video Slides is a companion slide deck that follows along with the Video. The last item, the Automatic Writing MP3 Audio Meditation consists of two tracks, which are provided as two MP3 audio files. In the first track, Kent guides the listener through a balancing exercise. In the second track, Kent guides the listener through a deep meditation to prepare the listener to connect with Spirit using an automatic writing technique. The background music is an original composition created by Kent in his music studio. Please note: You can download your products up to three times (3), and have 30 days in which to do so. If you misplace your files, or need to download again for any reason, please contact us so we can provide you a new temporary link.